Saenz dedicates a flag to the United Resistance of Garden Grove. Yet another commemorative flag by Ernest M. Saenz, dedicated to the United Resistance of Garden Grove. Garden Grove stood fast as violence erupted at their resistance against racism. The people of Garden Grove are world renown for their earth friendly policies. Their city laws actually promote the planting of trees versus cutting them down. It takes a consensus of neighbors before a tree can be removed from city streets. Considering that the people of Garden Grove so strongly protect trees and the environment, how could the Anties (Anti-Illegal Immigrationist) think that these people would not come to protect the most vulnerable of humans among us? 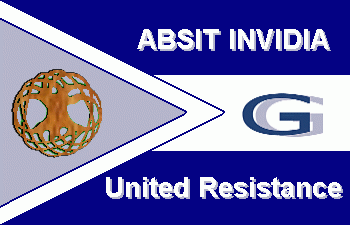 The City’s motto “Absit Invidia” means, “Let there be no ill will” and Garden Grove’s United Resistance proved that they live by this code of honor on May 25th, 2005. The flag is adorned with the Tree of Life symbol in the left triangular field. The colors of the flag are the city’s municipal colors; the GG is the municipal logo.